After the oath and his address, the old general climbed on his horse and headed for the White House. As one witness told it: “The President was literally pursued by a motley concourse of people, riding, running helter-skelter, striving who should first gain admittance into the executive mansion, where it was understood that refreshments were to be distributed.” The unruly bunch pushed into the White House, clods standing on the silk-upholstered furniture in muddy boots to get a glimpse of the new president (who was trying not to be crushed by his well-wishers). “The reign of King Mob seemed triumphant,” wrote Supreme Court Justice Joseph Story, appalled. When the stewards finally delivered buckets full of Orange Punch, the crowd lunged for the pails, overturning furniture, smashing the glassware, and — perhaps worst of all — spilling the punch itself. Quick-thinking waiters lugged the remaining barrels of punch out onto the White House lawn, enticing Jackson’s admirers to take the party outside. I scoured 19th-century cookbooks for Orange Punch recipes and found them to be fairly consistent: Make a sugar syrup and infuse it with orange peel; use it to sweeten a mix of orange juice, lemon juice, rum and brandy. Some also added a taste of orange curaçao (orangey overkill) or maraschino liqueur. As specified, the drink isn’t bad, but it isn’t anything I’d trample White House furniture to get at. So I tweaked it a bit. I flavored the sugar syrup not only with orange peel but also with mulling spices and brightened the punch with the judicious addition of soda water. And to counteract the drink’s tendency toward over-sweetness, I added a dash of Angostura bitters to each glass. I’ve given the recipe in proportions, easy to make by the bucketful if you’ve got a mob of your own to serve on Inauguration Day. Combine 1 cup sugar with 1 cup water and heat to a boil, stirring to dissolve the sugar. Reduce heat to a low simmer. Add the peel from an orange and mulling spices (a couple of cinnamon sticks, some whole cloves and allspice berries). After 15 minutes, remove from heat and let it sit for several hours. Strain. The most riotous party scene in the U.S. political arena occurred when the war hero Andrew Jackson, considered a country bumpkin by many a patrician Easterner, arrived in Washington, D.C. An estimated 30,000 of his supporters converged on the young capital city, mostly from the South and West, to whoop it up for the March 4 swearing-in. These frontier crowds didn’t just want to fill the saloons of the capital — they wanted to shake Jackson’s hand and pay a visit to his swank new home, the President’s House, which had recently been painted a glossy white. The scenes of debauchery that ensued would make the city’s genteel, fashion-obsessed locals blanch. Until this time, inauguration receptions had been discreet and civilized affairs. Straight-laced members of the American aristocracy would gather at the President’s House and offer their formal congratulations over coffee and biscuits, while quietly rejoicing that power was remaining in the hands of the land-owning elite. 1828 would change all that. Jackson was the first truly popular president: Leading a faction that would later become the Democratic Party, he swept into power by taking advantage of new laws that almost tripled the numbers of registered American voters from 365,000 to a million, and. He himself was one of the country’s fabled self-made men, a poor autodidact from the Tennessee frontier who served in the Revolutionary War as a teenage foot soldier and rose in the ranks to become a successful general in the War of 1812 (he had a dent in his skull from a British sword). He was so popular that any man who had cast a ballot for Jackson in the 1828 election felt that he had been extended a personal invitation to attend the inauguration. What’s more, the election of 1824 had been “stolen” — Jackson had swept the popular vote but had not gained a majority in the Electoral College — and his supporters wanted to make sure they finished the job. Ever since the British burned Washington to the ground 16 years earlier, successive mayors had been trying to make the capital presentable. It was an uphill job. The artificial city was still a ramshackle and provincial affair, far from the fine metropolis envisioned by designer Pierre Charles L’Enfant — “a parody upon all the other capitals that were ever actually built up and inhabited since the beginning of the world,” scoffed the architecture critic for the Philadelphia Monthly. The city had only one decent thoroughfare, Pennsylvania Avenue, which ran between Congress and the Presidential House, while the rest was bleak swamp and sand. In fact, Washington was completely unprepared for the hordes, wild-haired or otherwise, that arrived upon it. The hotels filled up days beforehand, as did those in nearby Georgetown and Alexandria, so innkeepers happily tripled their room rates and rented space on their kitchen floors. Thousands simply camped out under the open sky. For the coarse Jackson supporters, mostly outdoorsmen of sorts, this was no hardship: They were simply bivouacking as if they were on a hunting trip in the Adirondacks. Many of them had never seen a real city before, so even Washington was an awe-inspiring site. Unwashed hayseeds they may have been, but on the big day it would be Sunday best — every man with his beaver-skin hat, every woman with a bonnet. At dawn, a 13-cannon salute woke the city, and crowds began to gather outside the modest hotel on Pennsylvania Avenue where Jackson himself had taken a suite. At 11 a.m., the gaunt, white-haired object of the peoples’ affections emerged dressed in funereal black (he was mourning his beloved wife, who had died after his election), to ear-splitting huzzas. In this era before Presidential assassinations, Jackson walked to the Capitol on foot with fans surging all around him, some on horseback, some in carriages, a bevy of pretty girls in a wagon alongside. At the Capitol, he took his oath of office and gave an inaudible speech. No sooner had he finished than things began to get out of hand. The crowd had become a sea covering every available space, and it now surged through the barriers and mobbed the new President. Jackson’s friends had to force a way for him back along Pennsylvania Avenue to the White House, where he and his men had prepared some modest refreshments for his supporters. This “reception” went awry from the start. When the staff opened the doors to bring out the first barrels of orange and rum punch, the exultant crowd burst in and knocked several over, soaking the floor in sticky booze and smashed glasses. The guests were, said eyewitness Margaret Bayard Smith, “a rabble, a mob, of boys, negros, women, children, scrambling, fighting, romping… Ladies fainted, men were seen with bloody noses, and such a scene of confusion as is impossible to describe.” The crowd quickly took possession of the White House: So many people were squeezed inside that the building itself creaked and shuddered dangerously. A bodyguard of loyal friends had to form a ring around the scarecrow figure of Jackson so he wouldn’t be crushed to death or asphyxiated by well-wishers. The strangers behaved if they were in a Mississippi saloon, standing in mud-caked boots on the damask chairs for a better view. But it wasn’t all riff-raff. Even some of the stuffy D.C. toffs got into the anarchic spirit. “Everyone from the highest and most polished,” marveled one attendee, Joseph Story, an associate judge of the Supreme Court, “down to the most vulgar and gross of the nation,” wanted their slice of the action. There are numerous accounts from well-to-do white observers who were shocked to see free African-Americans in the throng, including bevies of children and one “stout black wench” (noted Senator James Hamilton Jr. with disdain) who sat by herself in a back room, “eating in this free country a jelley with a gold spoon in the President’s House.” Some compared the crowd to the barbarians in Rome. It was too crowded to get through the front door, so anyone who wanted to leave had to crawl out a first floor window. At 4 p.m., friends managed to spirit Jackson back to his hotel, but the party continued at the White House for hours. At around dusk, servants struck upon the idea of passing barrels of liquor and ice cream out the window in order to get the revelers out onto the lawn, where they could do less damage. It worked. Despite the chaos, even the most dubious observers admitted that something “sublime” had occurred at Jackson’s party. There was no doubt that a new era of American democracy had begun. “It was the People’s day, and the People’s President, and the People would rule,” wrote Margaret Smith. When the dust settled on the evening, the White House looked like a war zone. Thousands of dollars worth of china and glassware had been smashed or taken as souvenirs, the carpets were shredded, the upholstery ruined. Jackson was not abashed. He took the near-riot as an opportunity to have Congress allocate enough money to actually finish the President’s abode to the original design of Benjamin Latrobe. He got $50,000 to refurbish it, acquiring sumptuous new furniture, elegant dining ware, and no less than 20 spittoons for the East Room. “Popular legend has it that the lack of content on three pages of George Washington’s diary can be traced directly to a bowl of punch. But it wasn’t just any old punch–it was Fish House Punch, a concoction that packs… well, you can probably fill in the blank. Therecipe for true Fish House Punch was kept secret for almost 200 years. The formula was first developed at the Fish House Club, a.k.a. the State in Schuylkill, or simply the Schuylkill Fishing Company in Philadelphia, an organization formed in 1732 by a group of anglers who liked to cook. They spent their days fishing for perch in the Schuylkill River, and as the sun went down, they headed to the clubhouse to make dinner with their catch. Nairobi, Kenya (AP) — From the shantytowns of Kenya’s capital to the rural homestead of Barack Obama’s relatives, thousands of Kenyans slaughtered goats, hoisted American flags and partied into the night Tuesday as a man they see as one of their own ascended to the world’s most powerful office. In Nairobi’s sprawling Kibera slum, residents raised a U.S. flag and declared Kenya to be America’s 51st state. In the village of Kogelo, where Obama’s father was born and some family members still live, 5,000 people gathered as 10 bulls and six goats were slaughtered for a luxurious feast at a time when the country is enduring a crippling food crisis. Women dressed in colorful print cloths performed traditional dances to the rhythms of cowhide drums. “Yes, yes, yes!” shouted Maurice Odoyo, 34, joining hundreds of people trying to catch a glimpse of Obama’s speech on a 12-inch television set up in a clearing in Kibera, one of Africa’s largest slums. “His father comes from this country. Obama will remember us, how we are suffering.” The election of a black American president with African roots stands as a powerful symbol on a continent where so many people’s hopes are hobbled by crushing poverty and corruption. And in Kenya, a struggling country of 38 million riven a year ago by a deadly post-election crisis, Obama’s presidency was a source of pride and inspiration. Kibera is a stark reminder of the poverty in a country where one in five people get by on less than a dollar a day. The slum is a maze of tin-roofed shacks where raw sewage flows through dirt tracks. On Tuesday, children wearing Obama T-shirts huddled by a bonfire to keep warm. 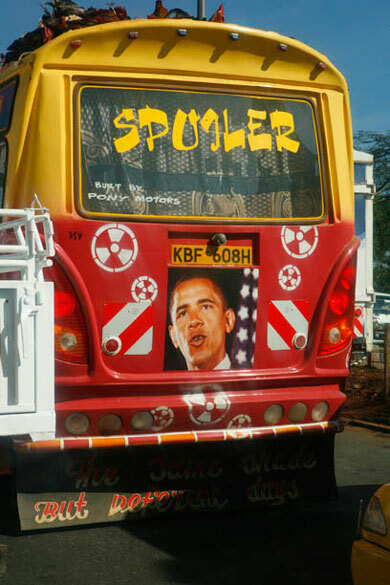 Despite Kenya’s problems, Obama’s victory has enthralled the nation. “We missed the Kenyan presidency but we got a bigger one, the American throne,” Seth Oloo, a physician in the western town of Kisumu, told The Associated Press. That Kenya was out in force at Casablanca. Packed with Nairobi’s beautiful movers and shakers, this was cool, contemporary East Africa. Models with tiny waists in Imani gowns wafted through the Morroccan-themed bar. Musicians and media types sucked on hookahs and sipped mojitos. People danced to D.J. Dudu Sarr’s fashionable African mix: Senegalese hip-hop, Suzanna Owiyo, Kenyan Genge music. By the time the vice-presidential inauguration had come and gone, the club was beginning to hush. Soon everyone was sitting at red-white-and-blue-draped tables in the garden in front of huge flat-screen TV’s. Obama stepped forward, and Casablanca was so quiet I could hear the singing of the cicadas and tree frogs. The moment hung in the thick night air, and when the new president gave a shout out to Kogelo, the village where he traces his roots, the crowd burst into a cheer. 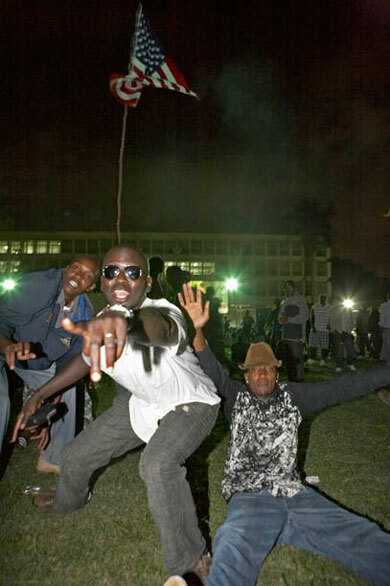 Then Nairobi began to party in earnest. The garden started thumping to the dance music of Afro-Project, Nairobi’s hottest new act. And Ciiru finally took to the stage for her Beyoncé moment, singing rich, resonant African soul. Soon I was dragged away again, this time by my two new friends Sidney and Arthur, who were bored of the fashionable crowd. They were after beer, not cocktails. So we ended up downing bottles of Tusker in the rustic-chic K1 Klubhouse, a kind of mock jungle bar where everyone wore Diesel jeans and danced to high-energy Kenyan Kapuka music. The three Obama cousins at the celebration in Silver Spring came as part of a 20-member delegation from Kogelo, the Obama homeland. They were among the quietest in the boisterous, good-humored crowd. With few words, each tucked into heaping plates of ugali (a semihard cake of maize), mandazi sweet buns, roast potatoes, a whole fish, turkey, fried chicken, creamed spinach and grapes. Wilson Obama ate the traditional way: with his hands. Although he wore a blue baseball cap pulled low on his brow, the others soon teased that they could tell right away that he was an Obama. “It’s the ears!” they shouted. Wilson Obama’s ears, like his famous cousin’s, stick out famously. In Kisumu, Wilson Obama, 59, runs a small store of “consumables,” selling wheat, flour, sugar, detergent and cooking oil. John Ogembu, 43, teaches biology and chemistry at a secondary school. They are both the president’s second cousins. Moses Obama, 35, is a lecturer on banking and finance at a local university. His mother was Barack Obama Sr.’s older sister, making him the president’s first cousin. They have met the president and eaten meals with him when he has visited Kenya. They’ve followed every twist of the campaign. Why they decided to come is simple: They could not let history as strange and wonderful as this pass them by. “What has happened is not just for America,” Ogembu said. “It is for the whole world.” Ogembu and his cousins didn’t make it to the swearing-in in time. They desperately showed their passports with the Obama name, but Secret Service agents would not let them in the secure area near the president, said Grace Owuor, who was organizing the family’s travel. They returned to their hotel and watched the event on television. Nicholas Rajula, the spokesman for the 20-member delegation from Kogelo, said that village tradition required that they come and stand as “witnesses” and to “wish our son well.” (Some watched on TV as well.) They claim him, Rajula laughed, even though villagers called him “mzungu,” Swahili for white, when they first saw him. Just after Obama was sworn in as a U.S. senator, Rajula, 49, journeyed to Washington on behalf of the ancestral homeland to bring him the traditional Luo symbols of leadership: a fly whisk, a three-legged stool and a shield. “We wanted to bring him a spear, too,” Rajula said. “But we couldn’t get it through security at the airport.” This time, they did not bring gifts. They can be given only once, Rajula explained. And, he said, Obama has already used their powers well. The president’s elderly Kenyan stepgrandmother came, bearing a gift of an oxtail fly whisk. Cousins journeyed from the South Carolina town where the first lady’s great-great-grandfather was born into slavery, while the rabbi in the family came from the synagogue where he had been commemorating Martin Luther King’s Birthday. The president and first lady’s siblings were there, too, of course: his Indonesian-American half-sister, who brought her Chinese-Canadian husband, and her brother, a black man with a white wife. When President Barack Obama was sworn in on Tuesday, he was surrounded by an extended clan that would have shocked past generations of Americans and instantly redrew the image of a first family for future ones. 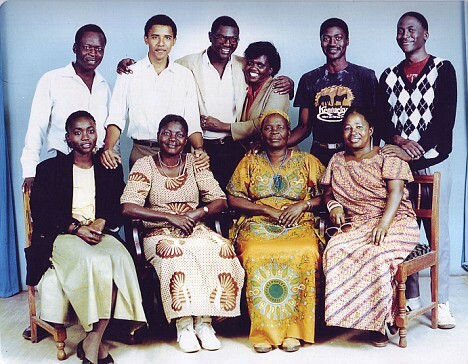 As they convened to take their family’s final step in its journey from Africa and slavery to a White House built partly by slaves, the group seemed as if it had stepped out of the pages of Obama’s memoir — no longer the disparate kin of a young man wondering how he fit in, but the embodiment of a new president’s promise of change. Though Barack Obama is the son of a black Kenyan, he has some conventionally presidential roots on his white mother’s side: abolitionists who, according to family legend, were chased out of Missouri, a slave state; Midwesterners who weathered the Depression; even a handful of distant ancestors who fought in the Revolutionary War. (Ever since he became a U.S. senator, the Sons of the American Revolution has tried to recruit him.) But far less is known about Michelle Obama’s roots — even by the first lady herself. Growing up on the South Side of Chicago, “it was sort of passed-down folklore that so-and-so was related to so-and-so and their mother and father was a slave,” Robinson said. Drawing on old census data, family records and interviews, it is clear that Michelle Obama is indeed the descendant of slaves and a daughter of the Great Migration, the mass movement of African-Americans northward in the first half of the 20th century in search of opportunity. Michelle Obama’s family found it, but not without outsize measures of adversity and disappointment along the way. Only five generations ago, the first lady’s great-great-grandfather, Jim Robinson, was born a slave on Friendfield Plantation in Georgetown, S.C., where he almost certainly drained swamps, harvested rice and was buried in an unmarked grave. As a child, Michelle Obama used to visit her Georgetown relatives, but she only learned during the campaign that her forebears had been enslaved in the same town where she and her cousins had played.According to Megan Smolenyak, a genealogist who has uncovered the roots of many political figures, Michelle Obama has ancestors with similar backgrounds across the South. The public records they left behind give only the briefest glimpses of their lives: Fanny Laws Humphrey, one of Michelle Obama’s great-great-grandmothers, was a cook in Birmingham, Ala., born before the end of the Civil War. Another set of great-great-grandparents, Mary and Nelson Moten, seem to have left Kentucky for Chicago in the early 1860s, a hint they might have been free before official emancipation. And in 1910, some of Michelle Obama’s ancestors are listed in a census as mulatto, adding some support to family whispers of a white ancestor. The jobs that her relatives held in the early 20th century — domestic servant, coal sorter, dressmaker — suggest an escape from sharecropping, the system that trapped many former slaves and their children in penury for generations. Still, the family’s progress was uneven. Jim Robinson was born into slavery, but his son, Fraser, ran a lunch truck in Georgetown. In turn, his son, also named Fraser, struck out for Chicago in search of something better. But he was unable to find work, and left his wife and children for 14 years, according to his son, Nomenee Robinson. As a result, Michelle Obama’s father was on welfare as a boy and started working on a milk truck at 11. After serving in the Army in World War II and finally securing a job as a postal clerk, Fraser Robinson Jr. rejoined his family. He was so thrifty that he would bring home chemicals to do the family dry cleaning in the bathtub. But his son — Michelle Obama’s father, Fraser Robinson III — became overwhelmed with debt and dropped out of college after a year. He worked in a city boiler room for the rest of his life, helping to send his four younger siblings to college, then his two children, Michelle Obama and her brother, to Princeton. For all of the vast differences in the Obama and Robinson histories, a few common threads run through. Education is one of them. As a young man, Barack Obama’s father herded goats, then won a scholarship to study in the Kenyan capital. When Barack Obama lived in Indonesia as a child, his mother woke him up for at 4 a.m. for English lessons; meanwhile, in Chicago, Michelle Obama’s mother was bringing home math and reading workbooks so her children would always be a few lessons ahead in school. Only through education, generations of Robinsons taught their children, would they ever succeed in a racist society, relatives said. “My mother would say, ‘When you acquire knowledge, you acquire something no one could take away from you,’ ” Craig Robinson said. The families also share a kind of adventurous self-determination. In the standard telling, the Obama side is the one that bent the rules of geography and ethnicity. Yet the first lady’s family, the supposed South Side traditionalists, includes several members who literally or figuratively ventured far from home. Nomenee Robinson was an early participant in the Peace Corps, serving in India for two years; later, he moved to Nigeria, where he met his wife; the couple now live in Chicago. Capers Funnye Jr., a cousin of Michelle Obama’s and a rabbi, was brought up in the black church, he said, but as a young man, he felt a calling to Judaism he could not ignore. In daring cross-cultural leaps, no figure quite matches Stanley Ann Dunham Soetoro, Barack Obama’s mother. As a university student in Honolulu, she hung out at the East-West Center, a cultural exchange organization, meeting two successive husbands there: Barack Obama Sr., an economics student from Kenya, and later, Lolo Soetoro, an Indonesian. Decades later, her daughter, Maya Soetoro was picking up fliers at the same East-West Center when she noticed Konrad Ng, a Chinese-Canadian student, now her husband. Now the Obama-Robinson family’s move to the White House seems like a symbolic end point for the once-unquestioned idea that people of different backgrounds should not date, marry or bear children. In Barack Obama’s lifetime, racial intermarriage not only became legal everywhere in the United States, but has started to flourish. As many as a third of white Americans and over half of black Americans count someone of a different race among their close relatives, estimates Joshua R. Goldstein of the Max Planck Institute for Demographic Research. Diversity inside families, said Michael J. Rosenfeld, a sociologist at Stanford University, is “the most interesting kind of diversity there is, because it brings people together cheek by jowl in a way that they never were before.” “There’s nothing as powerful as family relationships,” Rosenfeld said, “and that’s why interracial marriage was illegal for so long in the U.S.” Initially, some of the unions in the Obama family caused consternation. “What can you say when your son announces he’s going to marry a Mzungu?” said Sarah Obama in an interview, using the Swahili term for “white person.” But it was too late, she said, because the couple was deeply in love. We are greatly honored to join the millions around the globe congratulating you on taking office as the president of the United States of America. We believe that we are witnessing something truly historic not only in the political annals of your great nation, the United States of America, but of the world. Your election to this high office has inspired people as few other events in recent times have done. Amidst all of the human progress made over the last century the world in which we live remains one of great divisions, conflict, inequality, poverty and injustice. Amongst many around the world a sense of hopelessness had set in as so many problems remain unresolved and seemingly incapable of being resolved. You, Mister President, have brought a new voice of hope that these problems can be addressed and that we can in fact change the world and make of it a better place. We are in some ways reminded today of the excitement and enthusiasm in our own country at the time of our transition to democracy. People, not only in our country but around the world, were inspired to believe that through common human effort injustice can be overcome and that together a better life for all can be achieved. Your presidency brings hope of new beginnings in the relations between nations, that the challenges we all face, be they economic, the environment, or in combating poverty or the search for peace, will be addressed with a new spirit of openness and accommodation. There is a special excitement on our continent today, Mister President, in the knowledge that you have such strong personal ties with Africa. We share in that excitement and pride. This entry was posted in spectre and tagged leisure, popular holidays by secret santa. Bookmark the permalink.